Info "Drag a line between the rings to make 'em disappear!" 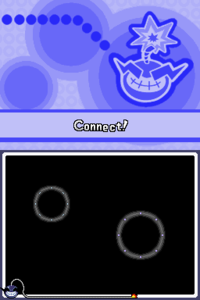 Ring Master is a microgame found in the Ninja Scribble stage in WarioWare: Touched! The objective of the game is to draw a line from ring to ring that connects them all. 1st level difficulty: There are two rings to connect. 2nd level difficulty: There are four rings to connect. 3rd level difficulty: There are six rings to connect. This page was last edited on January 17, 2019, at 15:12.